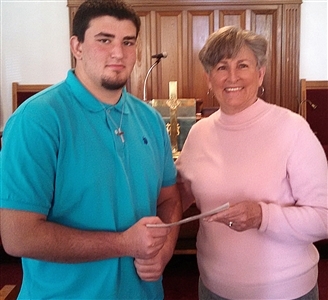 Michael Hatfield, left, receives a scholarship from Mary Lou Short, missions coordinator at St. George Island UMC. Photo from Mary Lou Short. ST. GEORGE ISLAND -- Michael Hatfield, a junior at Franklin County High School, will join a mission team to Leon, Nicaragua, this summer with help from a $350 scholarship from the Florida Conference. Hatfield, son of Michele Provenzano of Eastpoint, is active in the youth group of First UMC, Eastpoint, and the ReAction Youth group of the Apalachicola-St. George Island Cooperative Parish. He has a busy summer ahead. The teenager will join a team of 20 heading to Nicaragua in June, where the cooperative parish will partner with 12 churches to conduct daily prayer walks, work with youth, help with Vacation Bible School and participate in programs that feed the hungry, said Mary Lou Short, missions coordinator at St. George Island UMC. Also this summer, Hatfield plans to volunteer at United Methodist-operated Centenary Camp in Quincy and participate with other youth groups in South Georgia building a house.